New England IPAs mean different things to different people. 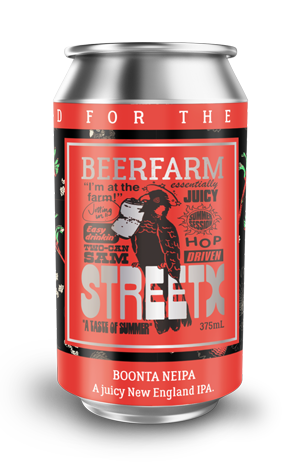 For Beerfarm, it means collaborating with Perth streetware stalwarts Street X and throwing down a bespoke 6 percent ABV IPA loaded with a hop cocktail of El Dorado, Citra, Sorachi Ace and Magnum. Heavy doses of late-hopping and dry-hopping equate to a mere seven on the International Bitterness Units (IBU) scale and, if that has you questioning whether this is really an IPA at all, fear not, as what it might lack in hop bitterness it makes up for in big, punchy hop aroma and juicy fruit flavours. With a light, hazy aesthetic, this beer is as enticing on the eye as it is on the palate. A lighter body and smooth mouthfeel round out what's a fresh and fruity ale that, in a world full of NEIPAs and just as much love for them, is sure to be a hit.